The council is responsible for developing, maintaining, applying and monitoring a strategy for local flood risk management from surface and groundwater. Areas of the city most at risk from surface and groundwater flooding are those bordering rural areas, where rainwater running from the downs meets rising groundwater. The SCAPE project is looking at reducing the risk of surface water flooding in central Hove and Patcham. Go to the SCAPE project web page. Areas of the city’s western coastline are also at risk of flooding from the sea. The Environment Agency is responsible for flood risk management of these areas. Businesses and homeowners affected by flooding between 1 April 2013 and 31 March 2014 may be eligible for help through the Flood Support Schemes. As the lead local flood authority, we have a duty to investigate flood events (PDF 1.99mb) that take place in the city. We are now also a statutory consultee for major planning applications with regard to implications to the management of surface water. 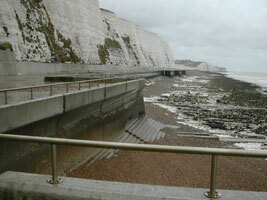 The city's coast defences are regularly inspected and maintenance work is carried out by the council's contractors. The planning of defences to keep abreast of overall deterioration and the effects of the changing climate are dealt with through shoreline management plans and strategic studies. 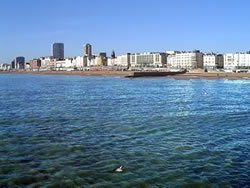 Brighton & Hove's coastline extends from Shoreham Port in the west to Saltdean in the east. The formation of the western end was influenced by the River Adur, which now reaches the sea to the west of the city boundary opposite Shoreham-by-sea. The low lying land of the coastal strip extends eastwards to Pool Valley and the Old Steine both of which used to be influenced by the sea. From this point a cliff line rises towards the east behind Madeira Drive and runs on to Saltdean and beyond to Newhaven. The city's beaches are divided in character at Black Rock, where the Marina now lies. To the west are large shingle beaches controlled by a 'field' of concrete and timber groynes which have developed over the decades. At low tide the toe of the shingle is often visible, seaward of this line sand and gravel runs out beyond low water. 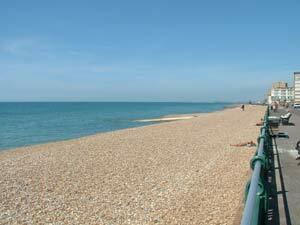 The shingle that forms the beaches drifts along the coast from the west to east by a process known as longshore drift. This gradual easterly movement of beach material occurs naturally as a result of the wind, tides and currents. The process is occasionally reversed for short periods when we have a run of easterly winds. To the east of Black Rock and the Marina a chalk cliff line runs all the way to the river Ouse at Newhaven. The beaches here have formed as a result of the retreat of the cliffs, leaving a wave cut platform. The foot of the cliffs is now protected by a seawall and Undercliff Walk. There is much less shingle in this section, the beaches at the Marina, Ovingdean, Rottingdean and Saltdean are only maintained by the large groynes which prevent the shingle from moving away. 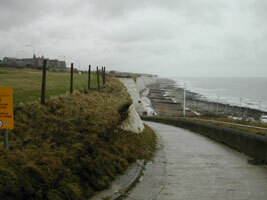 The beaches at Rottingdean and Saltdean were created by the importation of shingle. Generally the tide comes in twice in 24 hours and the difference in height between high and low water ranges from approximately 2 to 7 metres, depending on the phase of the moon. The very big tidal ranges occur around new or full moon (spring tides) and the smaller ones in between (neap tides). Tide tables predict the time and height of tides, but the actual time and height is influenced by wind speed and direction, atmospheric pressure and storm activity elsewhere in the Channel, North Sea and in the western approaches. Question: Do any statutory notices relating to flood and coastal erosion risk management subsist in relation to the property? 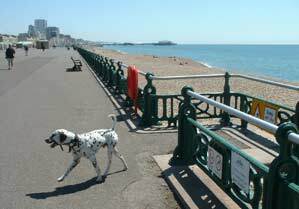 Answer: No properties in Brighton & Hove have statutory notices affecting them.